Throughout the centuries, people have used gourds to create crafts, musical instruments and toys, ranging from maracas to birdhouses to seasonal ornaments. Making a rattle out of a gourd is an easy, low-cost project you can do by yourself or in a group, depending upon how many gourds are available. Choosing a gourd that has a well-formed stem allows you to use the stem as the handle for your rattle, so you don’t have to take the extra time to create a separate handle. Allow your gourd to cure completely before cutting into it; if you hear the seeds rattling, your gourd is ready for crafting. Clean the outside surface of your gourd. Wet the gourd completely in a tub or bucket of hot water. Using a mild liquid dish soap and a metal scrubby, vigorously scrub the gourd, removing all mold stains. Use the dull side of a butter knife to peel off any mold-stained skin still remaining after the scrubbing. Dip your gourd into a bleach solution (one part bleach to nine parts water) to remove any remaining spores of mold. Allow your gourd to air-dry completely. Cut a hole in the bottom of your gourd. Using a keyhole saw, cut a circular hole approximately ½ inch in diameter from the bottom. Fill the gourd with hot water and let it soak for 20 to 30 minutes. Drain the water from your gourd. Remove the seeds and pith from inside your gourd, using a long-handled spoon or chopstick. Coat the inside of your gourd with varnish. Using a small paintbrush that fits inside the hole in the bottom, cover the inside with varnish, leaving the gourd to sit overnight to dry completely. 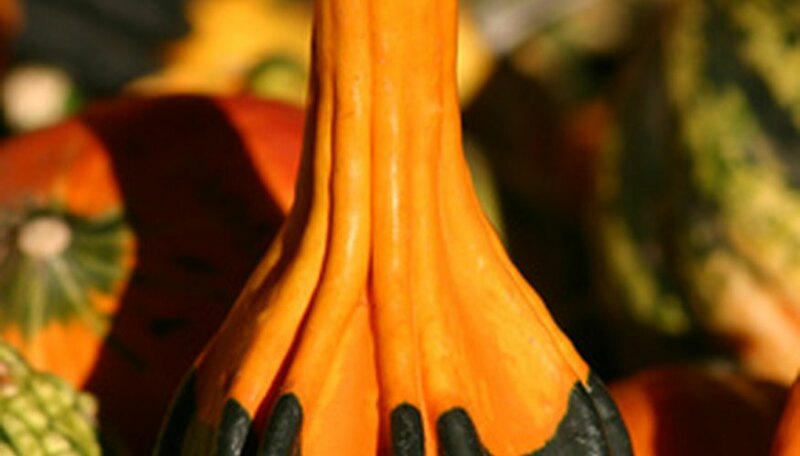 Put noisemakers inside your gourd. Possible choices include small stones or pebbles, beans, seeds or rice. Ginger Summit, co-author of “Making Gourd Instruments,” suggests that you block the hole with your hand and shake the gourd several times to test the sound of your gourd rattle. If you’d like a different sound, try a different material. Plug the hole in your gourd with the cork. Make sure the cork fits securely in the hole so your noisemakers won’t fall out. Paint the outside of your gourd rattle, if desired. Although you can use oil-based paint, acrylic paints are much more convenient and easier to clean up. If you plan to paint a design on your gourd, sketch it using a pencil first so you have an outline to follow. Dipper gourds are a popular variety for many rattle and shaker gourd projects because of their well-shaped stems.